Unable to fulfill the obligations. Mahesh, a successful upcoming software engineer’s life was in a real mess; it is good he realized it at least now. He had come to meet me for financial advice and plan. He started doing online trade after learning that his colleagues were making a lot of money. But he had lost heavily due to his ill-luck, inexperience and lack of knowledge. He indulged in tactics of taking loan from one to repay the other and taking loans from another to repay the earlier loan. Mahesh was in debt to the extent of 20 lacs, and his creditors were pressurizing him to pay back loans given. So far he has not disclosed all these things to his young loving wife, Lekha. Mahesh believed that Lekha was no good at finances and was just home bound. He also believed that he had to support her, but had no moral obligation to reveal anything else to her. Lekha was shocked to know that Mahesh was deep in debt. She was sensible and thrifty and thought they would soon lead a comfortable life, but her dreams were shattered and she was forced to sell all the jewelry and some of the household things that her parents had given her in marriage. They found that affording the rent of their flat was also too much, so they had to move to a smaller flat. Lekha was happy for she knew at least now and could keep a track of Mahesh’s finances, but she lost faith in Mahesh as he hid vital financial information from her and decided that she had to start earning also to feel financially secure in their relationship. Mahesh’s financial infidelity has broken the very foundation of their marital life that is based in trust, confidence and open discussion of all vital issues. Financial infidelity could go further in various other respects like the case of Ankit that hid vital information about the salary he earned and the increments he got, the loans he took, and the number of credit cards he used. He died of a severe cardiac arrest at the tender age of 32, and this was a shock not only to his wife and children, but also to his parents and in-laws. Ankit’s wife Anila believed that he had taken sufficient insurance to protect the family in case of his death. She also believed that he had enough savings. But Ankit a poor money manger had huge credit card, as he had borrowed for family expenses. Also he had a sizable amount of car loan and home loan. He had the habit of paying only the minimum due on credit cards. Besides he had defaulted payment of premium on some policies. Anila was shocked and disposed off their flat and car to close the loans. She was left with very little from the insurance Ankit had. She only wished that Ankit had told her everything so that she could have set aside enough for the family and not had to send their son Amit to a government school and have no finances for his future education . As the couple ties the knot and takes the marriage oath, it seems so pleasant, but I would say trust and respect for each other need to be for life. The break of trust and respect in major financial matters amounts to financial infidelity. I would say that transparency in marital relationships is very important and could help save situations that are irrevocable. You need to inform all your family members and dependents about your financial and debt status. Then you will be able to take decisions with much more clarity. Moreover, if your family members know about your debt, they will also change their spending habits and support you in getting out of debt faster. 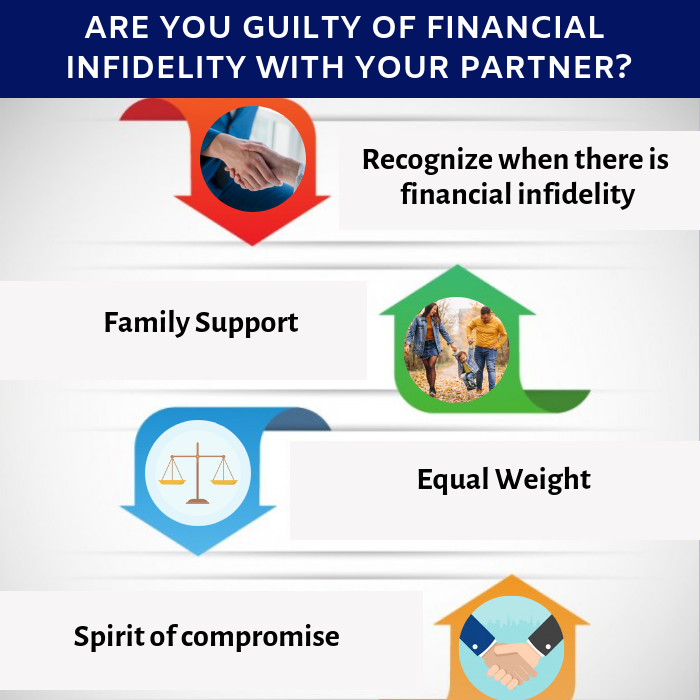 You could definitely be not guilty of financial infidelity if both your partner and you consider that equal weight should be given to both views in financial affairs. This is also necessary for the strong foundation of your relationship and family. It is true that mutual trust and respect coupled with compromise can do a lot to remove financial infidelity and save the extreme situation that we have seen in the case of Mahesh’s and Ankit’s family. A spirit of compromise could definitely save financial infidelities that have their roots in selfishness on the part of one of the partners. This also apples to relationships that is emotionally vulnerable with one partner feeling inferior or being terrorized emotionally. 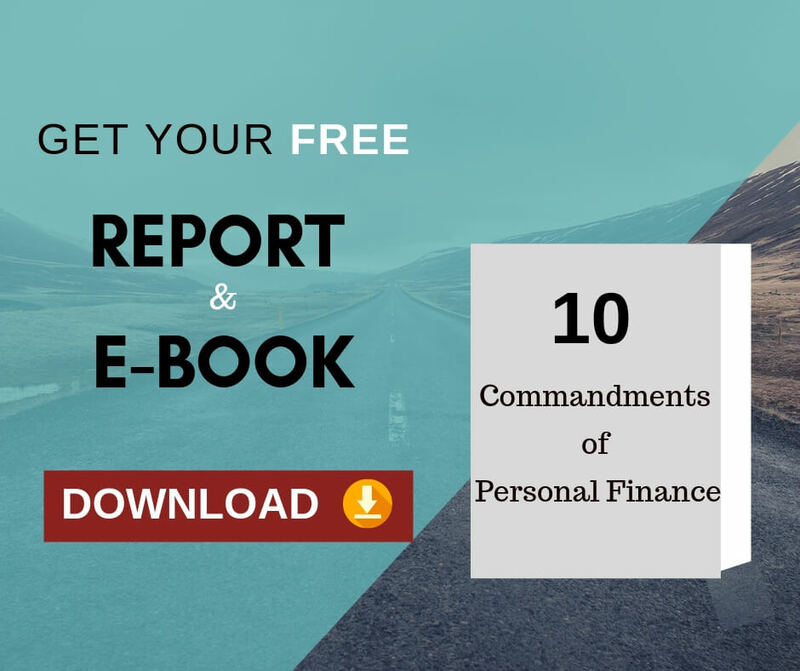 Lastly I am sure you would all refrain from the guilt of financial that could not just ruin the financial position of families and their overall peace, but could also cause certain devastating relationship issues that could not heal even in a lifetime. The financial infidelity pops in when there is no transparency between the couples. If they could spend some time together to create a transparent financial plan, all these issues will not come.